An Asalt on an instant classic. Born a legend, Glazed Tobacco is an immediate assault on your senses. Praised by the vaper faithful of the world for it’s wickedly smooth tobacco flavor, this bold vape juice blends hints of hazelnut, vanilla, almond and caramel, Glazed Tobacco’s nutty essence creates a masterful tapestry of taste across your palette. 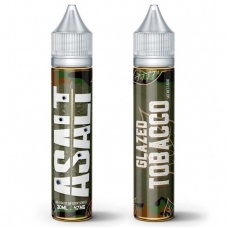 A true salt nic original, Asalt e-liquid created this seriously smooth juice destined for enjoyment beyond compare.